The NES Zapper (or Famicom Light Gun in Japan) is a pistol-shaped electronic light gun sold as part of the original NES in 1985 and the Nintendo Famicom in 1984. The Japanese iteration was a realistic portrayal of a revolver style hand gun, but when released in North America was made to look like an unrealistic science fiction ray gun that also tied into the design of the NES. The gun has no real grip; the handle is hard plastic. Early Zappers were gray, but later the color was changed to a neon orange due to the fact that federal laws were passed in the US prohibiting toy guns from resembling real guns during the 1980s. The Zapper allows players to aim at the television and shoot various objects. Different games used different targets; for example, the player may shoot ducks, clay pigeons, or other targets. When the trigger was pulled, the game blanked out the screen with a black background for one frame, then, for one additional frame, drew a solid white rectangle around the sprite the user was supposed to be shooting at. The photodiode at the back of the Zapper would detect these changes in intensity and send a signal to the NES to indicate whether it was over a lit pixel or not. A drop followed by a spike in intensity signaled a hit. Multiple sprites were supported by flashing a solid white rectangle around each potential sprite, one per frame. It is possible to cheat in games by changing the brightness and contrast of the television, or pointing the gun at a bright light. The gun thinks it is pointing at a solid white target and will report a hit. If there are multiple targets, the "hit" target will be the first to be lit with the white square. This is not as consistent with a fluorescent lamp due to the possible differences in timing of the lamp's flicker verses the timing of the television's refresh rate. Additionally, by using a magnifying glass on the gun, it fools the receptor into thinking that the rectangle is much larger than it actually is, allowing for a shotgun-like effect that will cover the entire screen. The same effect can be achieved by smearing grease on the lens. Pulling the trigger emits a loud, characteristic noise akin to a combination of a high-tensile spring snapping and a mechanical "click". The unique appearance of the orange Zapper has led it to appear in various media; for example, it appears as the weapon used by the title character of Captain N: The Game Master, a cartoon and comic book series. It has also appeared in the Wii video game WarioWare: Smooth Moves, in which a Star Fox micro-game features R.O.B. as a boss holding the orange Zapper as his weapon (In the Japanese version, he uses the Famicom Light Gun). 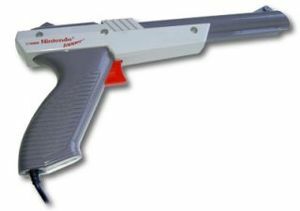 Although the Zapper name was not re-used for the Super NES gun peripheral, the Super Scope, its famous name was tapped by Nintendo once again when a gun-like attachment was developed for Wii. The "Wii Zapper" is merely a base unit for the remote and Nunchuk, as the Wii Remote can already function as a point-and-shoot controller, but it places the two controllers in a shell with a machine gun-like design. Pages in category "NES Zapper"
This page was last edited on 25 July 2013, at 05:18.